The Bailiwick of Guernsey consists of the Islands of Guernsey, Herm, Sark and Alderney, plus the smaller islands of Lihou, Jethou and Burhou. The Channel Islands came under the British crown when William, Duke of Normandy invaded England in 1066. To this day, the Queen’s official title in the Bailiwick of Guernsey is that of the Duke of Normandy. The link between Britain and France still survives today in Norman Law, surnames and Guernesaise, the local language. Nowadays Guernsey, its capital St Peter Port and the smaller islands are a favourite tourist destination. During 1940 – 1945, the islands were the only British soil occupied by German troops and huge numbers of defensive positions were built as part of Hitler’s Atlantic Wall. Of the population of 40,000, 17,000 were evacuated to England. The materials and effort spent on the Atlantic Wall was totally disproportionate to the strategic importance of the islands but Hitler was convinced that the British would try to recapture them. However the British Government had already decided in 1940 that the islands could not be defended without huge loss of life. By 1943 over five thousand foreign slave workers were working on Guernsey, many of whom lost their lives from exhaustion and starvation. They were guarded by a garrison of 13,000 German troops. After the D-Day Normandy landings in 1944, the islands became cut off from the rest of Europe and food and fuel supplies dried up. Life became steadily worse with both the occupying forces and islanders suffering from starvation. The cold winter of 1944 made life almost unbearable. However by the end of December, a life saving Red Cross ship, the SS Vega, docked at St Peter Port with much needed supplies and was to make several more trips up to May 1945. Finally on 9th May 1945 the German Commander surrendered and the first British Troops landed in St Peter Port from HMS Bulldog. Many reminders of the German occupation remain. Fortress Guernsey is a conservation programme started in 1993 and has been responsible for the restoration of several German watch towers and bunkers which are now open to the public. The story of the Nazi occupation is told at the Occupation Museum located near the airport. Every year islanders celebrate their freedom on Liberation Day, 9th May, a public Bank Holiday. Liberation Day is also a Bank Holiday in the other Channel Islands: Jersey on 9th May and Sark on 10th May. Alderney celebrates Homecoming Day on December 15th. 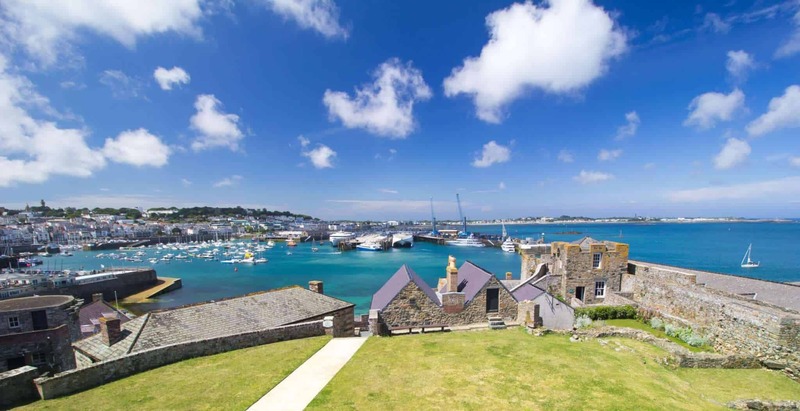 Guernsey is easily accessible by both air and ferry, please try our UK Travel Guide for further information. Occupation Society: www.occupied.guernsey.net Liberation Monument commemorating the islands freedom May 9th 1945. German Occupation Museum, Forest, Guernsey GY8 0BG. Tel: 01481 238205 The museum gives a picture of life in Guernsey during the German Occupation, 1940 -1945. It includes: authentic Occupation Street, unique audio visual experience, tearoom and garden and fortifications. German Military Underground Hospital Rue Des Buttes, St Andrews. Tel: 01481 239100 Hewn out of solid rock by slave workers of many nationalities under the control of the German Occupying Forces 1940 – 1945. Originally intended as shelters for large numbers of troops, these tunnels are virtually complete. The hospital was equipped with an operating theatre, kitchen, cinema, staff quarters and wards for 500 patients. Open March – November.